Thanks To My Obstacle Course, Another Toy Saved From The Island (Or Closet) Of Unused Toys! 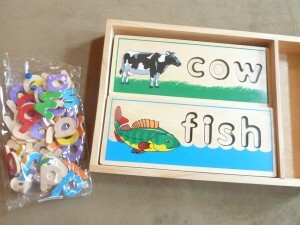 I got this great set of Melissa and Doug See and Spell puzzles to help with letter recognition and introduce word building with Andrew when he was around four. He wasn’t really interested in it until I began using it as a My Obstacle Course station activity with him and then he was hooked! 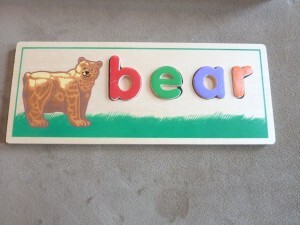 We would talk what the picture showed, the letters that made up the word and the sounds the letters make. It was also great for me to see him needing a certain letter, like a “b” and watch as he would pull out a “d” and try to get it to fit. I could then point out that even though they kind of look the same, they were different letters. 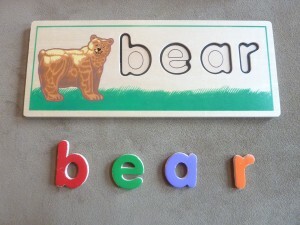 I would help him find the “b” so we could compare and contrast them and see which one fit. 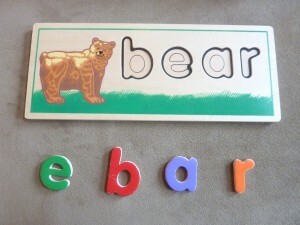 It may seem really basic because the puzzles have the letters cut out and labeled, but he still needed to find the correct ones to make the word. This is super easy to set up and allows your child to be part of creating a word without the worry of having to spelling it on their own. I would choose one or two puzzles for a station activity and depending on your child’s letter recognition skills, set out only the letters needed for the word or set out a bunch of letters for them to locate the correct ones. The station set up with letters provided in the correct order. The station set up with letters provided but not in order. Match up the letters so they fit in the space provided. Letters in and the word spelled! 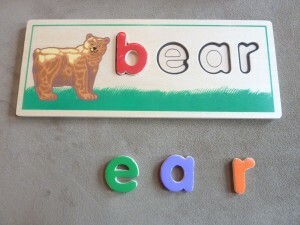 Even though this may seem like such a simple thing, it is a quick and easy station activity to see where your child is with letter recognition and also how they apply those skills. Even though Andrew is a good speller and hasn’t used this toy in a long time, I held onto it so I could share it here and with parents who are working on these skills. I had forgotten about it until Andrew found it in my office the other day (he loves getting in there with all of the My Obstacle Course supplies and goodies 🙂 ) and put them all together. He was so proud of himself and was clearly having a great time! It reminded me that sometimes he does enjoy doing things that don’t have power buttons and it was so nice to see! !